Ok, here’s a little quiz for you. What’s about an hour’s drive north of Perth (Australia) and, if you didn’t know better, looks a lot like Spain. The answer is of course, New Norcia. In the middle of the 1900’s a Benedictine monk came to Australia and wandered into the bush, then decided to set up a school for aboriginal children. There is a lot more to the story of how New Norcia was established but this blog is about art so I’d better stay focussed. 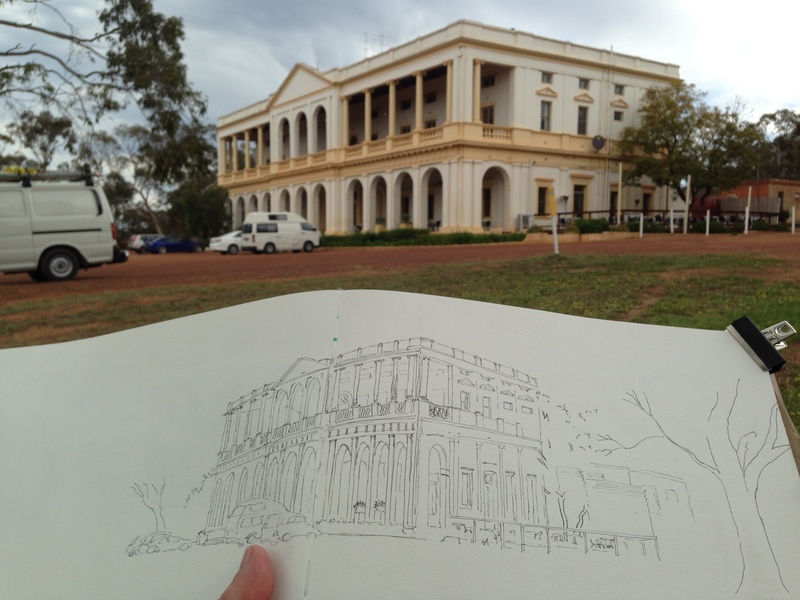 Anyhow, on the invitation of my brother Ed to “come on a “sketching break”, I travelled to New Norcia from Brisbane. Big deal? Not really, although I live in Brisbane (on the east coast of Australia) and so we needed to fly to Perth on the west coast of Australia first; then hire a car and drive north from Perth to New Norcia. After a five-hour plane flight and another hour in a car we finally arrived at “the Hotel” in New Norcia. There is only one hotel and that is the old boarding house that was built to accommodate families who came to visit their children who were being educated at the mission. The hotel had no wi-fi, no tv in the rooms, no air-conditioning and before I forget, guest had to share the bathroom facilities. Yes share. That means that if you’re “busting” and all the cubicles are taken, then you wait. Nice. But this isn’t about the accommodation either. 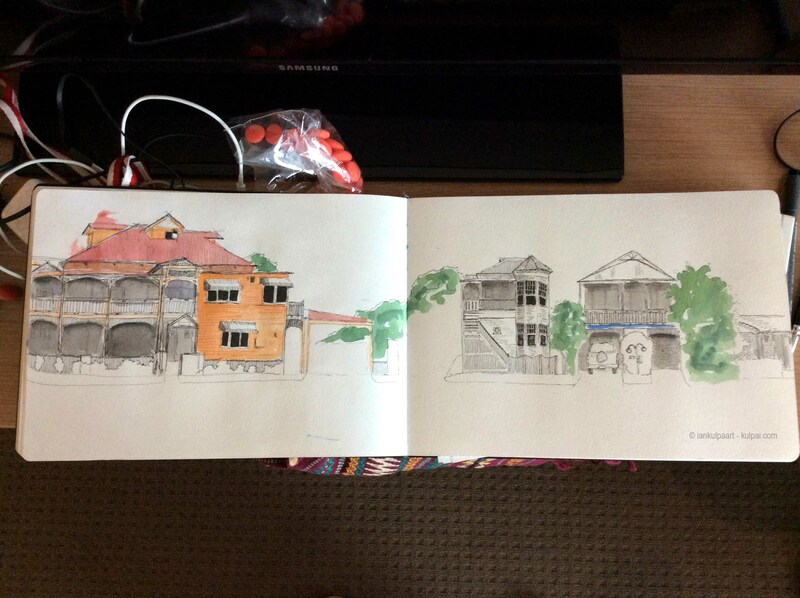 It’s about the art and what a place to sketch. I started with the hotel as you can see. From there we sketched the church, the graveyards, the apiary etc.etc. In the afternoon it was too hot so we spent that time on the front upstairs verandah touching up our mornings work. From our street, and literally 2 minutes away, is Bramble Bay. But we’re not in the best spot to enjoy views of the bay. If you want a really good view then you’ll need to live in Signal Row and of course, to live in this street you need to have a nice old house … or a nice new house that looks like a nice old house. Most, no all, of the houses in Signal Row have been renovated and consequently the street profile is just waiting to be sketched. The big house on the left is called “Eaglene” and used to be an old boarding house until it was purchased some years ago by a local businessman and restored to all its former glory. Since the restoration, the house has changed hands about 2-3 times but it still remains a great example of what an old “Queenslander” should look like.